Why theater? : Theater is live. There’s a direct connection with the audience. An energy unlike anything else. I like the communal parts of it too. Working with a cast, band, and crew. Different people brought together do what they love and to make something. It also brings people together in the audience. Different people sharing an experience. All happening at once and only once. Tell us about The Field: The Field is a musical myth about someone growing life. It’s told through a mix of spoken word poetry, music, and storytelling. The story follows Man In The Field setting forth to grow something out in The Field. There’s a Thief who steals crops and must be stopped. A majestic Harvest Woman appears in visions and says she’ll only be real when The Field is complete. People Of The Field work to grow. It’s about life, and what causes us to grow and what keeps us from growing. Stories, dreams, memories, and reality collide in “The Field.” This production in the FRIGID Festival features a cast of ten (Tucker Bryan, myself, Julie Congress, Briana Gibson, Gregory Levine, Matt Magrath, Clare Rea, Rosie Sowa, Jasmine Thomas, and Dennis Williams) a band of three led by music director Lucian Smith, and a crew of four. Since 2013, The Field was presented at Dixon Place, and UNDER St. Marks (MiniFridge Festival) and Muchmores (Brooklyn). 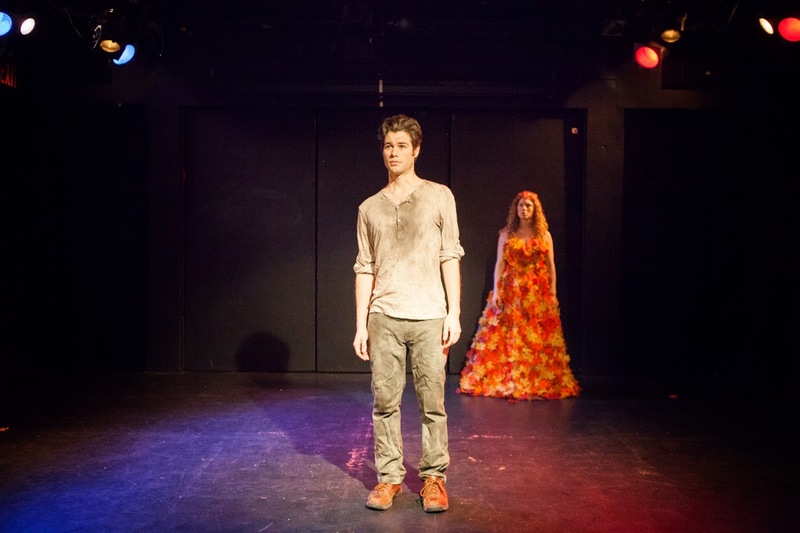 We’re excited to share “The Field” at The Kraine Theater in the FRIGID Festival! What inspired you to create The Field? : I was inspired by the desire to grow a life for myself, specifically as a writer and a person. I put those feelings to words, and words to music. I performed at a lot of open mics to see if the words and themes resonated with people. People dug it and told me to keep going, so I did. The story’s about working to grow life, and that’s what I’ve been doing with every re-write, rehearsal, recording and everything else that goes into a production. It’s a story I’m telling. But also one that I’m living as I’m working to grow The Field. What kind of theater speaks to you? What or who inspires you as an artist? : I like theater that introduces me to new worlds or new ideas. Something that broadens horizons. Something I that gives me things to take away. I feel like I learn a lot going to shows. Not like learning information but learning about experiences that people have, or situations that are possible. I like being transformed and moved. Life and people inspire me. Walking around seeing different places and people is always interesting. Stephen Sondheim. John Steinbeck. Ennio Morricone. Shel Silverstein, Dr. Seuss, Maya Angelou. If you could work with anyone you’ve yet to work with, who would it be? : Alex Timbers. What show have you recommended to your friends? : Hamilton. Who would play you in a movie about yourself and what would it be called? : No idea. If you could go back in time and see any play or musical you missed, what would it be? : Hair original Broadway production. What’s your biggest guilty pleasure? : Dark chocolate peanut butter cups. If you weren’t working in theater, you would be _____: A Teacher. What’s up next? : I’m doing a hometown show of The Field and then I’ll start recording an album and film some videos to explore different ways to tell this story.